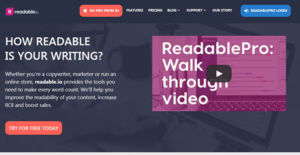 Readable is an innovative readability score checker designed to help copywriters, marketers, and authors improve the readability of their content, boost sales, and increase ROI. It’s a robust application that is powered by multiple readability algorithms and the proprietary ReadablePro scoring to deliver scoring results in minutes. The platform uses algorithms such as Flesch-Kincaid, Gunning Fox Index, Flesch Reading Ease, SMOG Index, Automated Readability Index, Coleman-Liau Index, IELTS and CEFR, and Spache and New Dale-Chall. Readable analyzes the readability of your content and recommends the best ways to improve upon it so that it engages a fair share of the general public. It scrutinizes keyword density, performs sentiment analysis, and computes the usual speaking and reading times of your content. Readable utilizes different factors including sentence length, syllable count, average word length, word familiarity, and sentence complexity to deliver accurate readability scores. Readable scores your content and proposes the best way possible to boost the readability. The readability scoring is handled by the advanced algorithms, whereas the highlighting engine pinpoints the key areas for improvement. This powerful engine flags long sentences, long words, and areas where passive voice is used, allowing you to improve the readability of the text. In addition, there is no limit to what you can score with Readable. The application has all the tools you need to score text, websites, individual URLs, emails, files (PDF and Word docs), and bulk scoring. It can easily scan an entire website to help you identify content that should be optimized along with the ways you can fix it. If you are an email marketer, you will marvel at the power of this tool. The solution helps you execute clear, compelling, and to-the-point, email marketing. Readable is not designed to measure only the readability of your content. It can examine text quality and keyword density to arm you with a range of statistics that make your content clearer and easier to understand. It ensures the text composition is on point and provides detailed reports with the breakdown of the main points. If you are interested in Readable it may also be sensible to analyze other subcategories of Best Writing Enhancement Software listed in our base of B2B software reviews. Each enterprise has different requirements and needs a system that can be personalized for their size, kind of employees and customers, and the specific industry they are in. For these reasons, no software can offer perfect tools off-the-shelf. When you search a software system, first be sure what you want it for. Read some Readable reviews and ask yourself do you desire basic features or do you want complex functionality? Are there any industry-specific features that you are seeking? Obtain the answers to these queries to assist your search. There are lots of aspects that you need to mull over and these include your finances, specific business requirements, your company size, integration requirements etc. Take your time, check out a few free trials, and finally select the system that presents all that you require to improve your company effectiveness and productivity. How Much Does Readable Cost? We realize that when you make a decision to buy Writing Enhancement Software it’s important not only to see how experts evaluate it in their reviews, but also to find out if the real people and companies that buy it are actually satisfied with the product. That’s why we’ve created our behavior-based Customer Satisfaction Algorithm™ that gathers customer reviews, comments and Readable reviews across a wide range of social media sites. The data is then presented in an easy to digest form showing how many people had positive and negative experience with Readable. With that information at hand you should be equipped to make an informed buying decision that you won’t regret. What are Readable pricing details? What integrations are available for Readable?